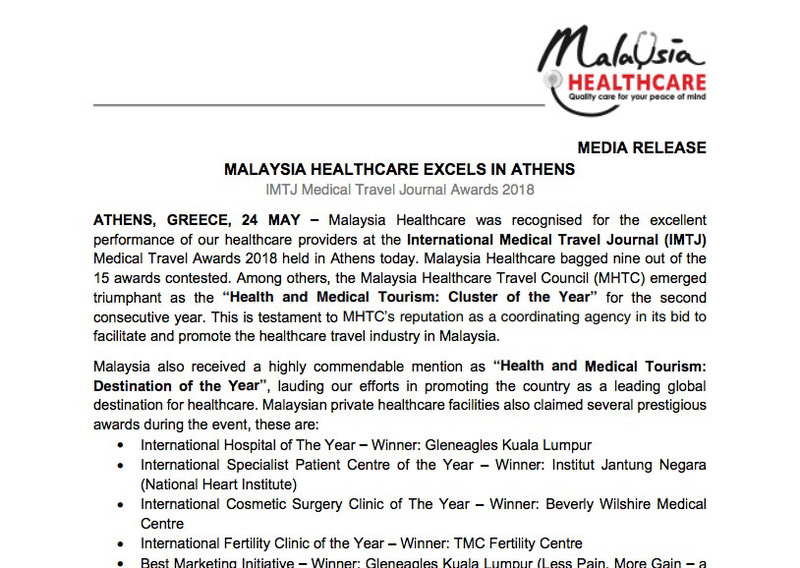 ATHENS, GREECE, 24 MAY – Malaysia Healthcare was recognised for the excellent performance of our healthcare providers at the International Medical Travel Journal (IMTJ) Medical Travel Awards 2018 held in Athens today. Malaysia Healthcare bagged nine out of the 15 awards contested. Among others, the Malaysia Healthcare Travel Council (MHTC) emerged triumphant as the “Health and Medical Tourism: Cluster of the Year” for the second consecutive year. 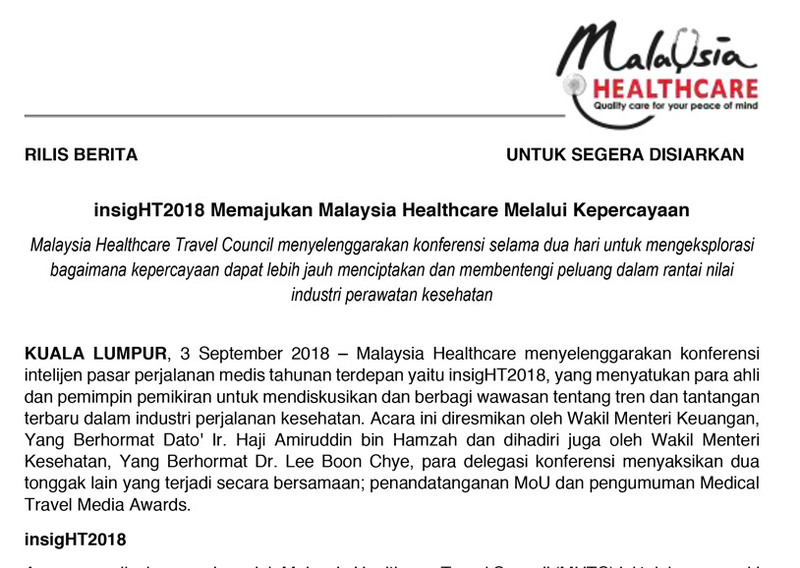 This is testament to MHTC’s reputation as a coordinating agency in its bid to facilitate and promote the healthcare travel industry in Malaysia. The IMTJ awards are judged by an independent panel of healthcare travel experts, chaired by IMTJ Managing Editor, Keith Pollard. The panel, made up of over 20 global healthcare travel experts, selected the winners based on a criteria list which exemplifies innovation and excellence in the healthcare travel industry. Among the names included in this esteemed line-up are Irving Stackpole of Stackpole and Associates; Ilan Geva of Ilan Geva and Friends; Dato’ Dr. Jacob Thomas of the Association of Private Hospitals of Malaysia; and Elizabeth Ziemba of Medical Tourism Training. “Over the past three years, Malaysia has been the defending champion of the “Destination of the Year” award, setting the benchmark for countries across the world vying to be the preferred destination for medical travel. Set apart by two defining reasons; firstly, for the structured data measurement system and secondly, for their delivery of a connective patient experience through their concierge service, Malaysia is still a force to be reckoned with when it comes to medical travel. It is encouraging to see Malaysian healthcare providers continue to strive for excellence and not rest on their laurels of their former glory,” Keith Pollard commented. The awards won by our healthcare providers are a further testament to Malaysia Healthcare’s success at garnering global acknowledgment within international healthcare travel, adding to Malaysia’s long list of accolades, which includes “Best Country in the World for Healthcare” by International Living’s Annual Global Retirement Index 2015 – 2017. Most recently in 2018, Malaysia was ranked as the top Asian country for retirement, placing fifth best globally after Mexico, Costa Rica, Panama and Ecuador. Previously, Malaysia Healthcare had won “Destination of the Year” at the IMTJ Medical Travel Awards thrice in a row from 2015 to 2017, which cemented our position as a leading global destination for healthcare. Malaysia Healthcare Travel Council (MHTC) had also won “Cluster of the Year” at the same awards in 2017, a significant testament to the strong government support and public-private collaborations which are indispensable drivers of the healthcare travel industry. Earlier, Sherene was a guest speaker at the IMTJ Medical Travel Journal Summit 2018. Talking on “Destination Development Session: What does the ideal medical travel destination look like?”, Sherene shared Malaysia Healthcare’s journey towards becoming a leader in healthcare travel. The IMTJ Medical Travel Summit 2018 held in Athens is a collaboration between the International Medical Travel Journal and Elitour, the Greek Medical Tourism Council, which brings together a thought-leadership conference and an awards evening. The summit is a high-level event, gathering decision makers in the healthcare travel and international patient market. MHTC is an agency set up in 2009 under the Ministry of Health to facilitate and promote Malaysia’s healthcare travel industry. In our pursuit towards propelling Malaysia to become the leading global healthcare destination, we are anchoring upon our strengths in medical capabilities and uniqueness as a destination for healthcare to focus on three key three initiatives. They are: (i) Position Malaysia as the hub for Fertility and Cardiology of Asia, (ii) Establish flagship medical tourism hospitals in Malaysia and (iii) Champion Malaysia’s first international health campaign, Malaysia Year of Healthcare Travel 2020 (MYHT 2020). With all these in place, we invite all healthcare travellers to “Experience Malaysia Healthcare, Embrace Malaysian Hospitality”.